The picture belonged to Bartolomeo Panciatichi, friend and counselor in France of Cosimo I de' Medici. 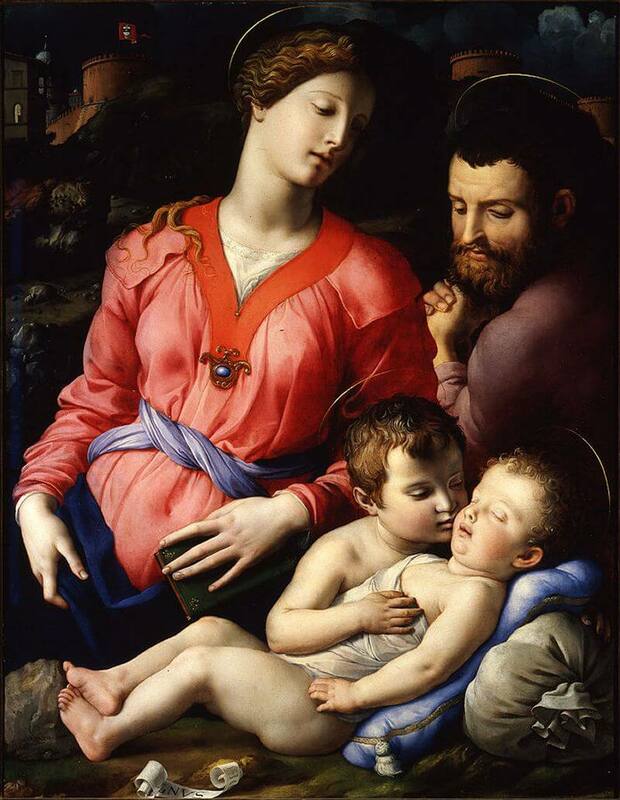 The painting represents the Holy Family with the little Saint John. The baby Jesus is sleeping parallel to the border of the picture leaning on a pillow and a sack, probably an allusion to the rest during the Escape from Egypt.Asleep like this he seems to give a preview on his death and the kiss of little John doesn't help. On the back of the two figures are placed Mary and Joseph, they are paying attention to the main scene. The face of Mary remembers the one of wife of Panciatichi, Lucrezia, and even the features of Venus. This painting is one of the most representative works of Agnolo Bronzino because it shows an incredible mastery of colors, lights and shapes. You are amazing -- such wonderful and speedy response and service. Thank you Uffizi.com for your excellent and speedy service. It is very much appreciated..
Firstly, I want to say that we were very happy with both of the tours we made with you. We really enjoyed touring the Uffizi with Jerry who is a great guide, he really helped us to learn about the chronology and history behind the masterful works, to understand and appreciate well. Thank again. With appreciation and best wishes,. Super! Thank you for your work! Many thanks for your help and for being so quick, as well. You are wonderful!